showcase the diversity of the Ancient Egyptian population. Companion Material Companion book in hardback or paperback, and a study guide/workbook are available separately. Although taste in art is subjective and not everyone will be as taken with Ms. Cuccia-Watts’ style as I am, I feel confident that anyone who can recognize raw talent will see it here, in the 78 remarkable paintings that comprise the JEIT. Let us never forget, too, the depth of intellectual imagination that underlies the systems of Ms. Cuccia-Watts’ latest decks, the JIET included—and more on that below. But for now, let’s talk art. Let’s start with the basics. Why is the JIET so different from the other ancient Egyptian-themed decks out there? 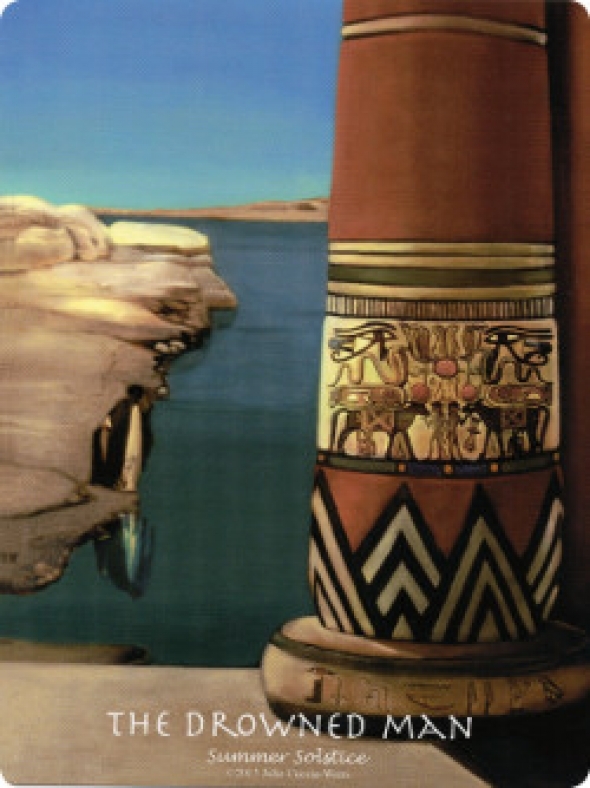 As you can see from the cards, the art style is not the pseudo-Egyptian style of most Egyptian decks; with the exception of a few selected cards such as The Tower, it does not emulate the high stylization of ancient Egyptian wall art and statuary. Now, I am a great admirer of ancient Egyptian art. However, in my opinion, it is more highly stylized and two-dimensional than many contemporary tarotists are looking for in a “reading” deck, in something to which they can feel an emotional as well as an intellectual connection. This deck’s characters don’t smile or laugh; they guffaw (Justice—simply one of the most joy-inducing images you’re likely to see in a tarot deck). They don’t attend to a project; they pant in childbirth, surrounded by concerned friends or attendants (8 of Coins). They don’t just hold fast to their possessions; an official or aristocrat looks bowed with the weight of his responsibilities or his wealth (4 of cards). Indeed, in my opinion, the luminous triumph of all Cuccia-Watts' decks is her numbered Minors. No other decks of my experience (and I have a tidy little collection) offer Minor scenes of such visual *and* emotional richness and complexity. The Knight of Swords isn’t an invincible robot on the battlefield, but a thin young boy holding aloft a decapitated head with an expression of mingled determination and concern on his young face; becoming a warrior isn’t easy on the hero himself (Prince of Swords). The Queen of Swords may be a solitary woman as traditionally associated with this court card, but here she has a heart about it—anguished tears flow down her clenched fist as she cradles the empty helmet of a Roman soldier, perhaps her departed lover (Queen of Swords). The Queen of Coins grins indulgently at the antics of the toddler she’s perched up beside her on her throne. I’ve never seen a King of Wands so thoughtful and ambivalent in expression; if Swords do represent Air here, I can see just how this fits. What about Majors, you ask? Each one is better than the last. Some of them are renamed—The Drowned Man for The Hanged Man—but most are traditional, including The Devil and Death. (For those who are wondering, The Devil is a mysterious and ambivalent image, not a traditional tarot hoofed beast or the artist’s own unconventional childbirth interpretation in the MAAT). The Magician (representing the Full Moon Cycle of Cancer) is another of Ms. Cuccia-Watts’ breastfeeding mothers and, regardless of how you feel about this choice of image for this Trump, the card is artistic perfection—a tableau of the quiet power we can harness in the still minutes before sunrise. This is also the first tarot deck—including Ms. Cuccia-Watts’ own past decks—or indeed any artistic enterprise I’ve seen that showcases the richness and diversity of Egypt’s population. I do not know this for a fact, and I may be wrong (I have not yet read the companion book to this deck) but it appears to me that the artist has made a conscious decision to include characters from at least five of the ethnic backgrounds that populated Egypt during the depicted periods of time: indigenous Lower/northern Egyptians as characterized by golden/brown-skinned characters with distinctively Egyptian features that would not be out of place on the streets of Cairo today; indigenous Upper/southern Egyptians and Nubians as characterized by the darker-skinned characters and as one would also meet on an excursion to the temple ruins of Upper Egypt; visiting or immigrant populations from tribes in other, more southerly parts of Africa; the ruling Greeks/Macedonians (a la Cleopatra, although I don’t know which cards, if a ny, depict her specifically); and the ruling Romans (I suspect, based on their dress, that the latter comprise the identifiably European characters with lighter skin). I did not identify any overtly Hebrew characters but they may well be there and I will notice upon increasing my use of the deck. Such historically-flavored diversity is fairly unheard of in most Western artistic depictions of ancient Egypt (the less said about those miscarriages the better) and I commend the deck creator for taking pains to include it in her deck. All in all, you will have to come to your own decisions about this deck and whether or not you feel it’s an acceptable appropriation of ancient Egyptian culture, religion and people. In my opinion, for the reasons above, it is one of the best such appropriations among tarot decks and, to the extent that one can accept the very possibility of a non-Western culture pressed into service for a European medium (tarot), I think you will find this deck respectful of the peoples and cultures that inspired it. “Yes,” you say, “but what about the system? Can someone reared in the Golden Dawn/Rider –Waite- Smith/Thoth tarot tradition use this deck right out of the box?” My short answer is, “Oh, yes indeed, although...” (The “although” is that I am an enthusiastic embracer of decks on their own terms, using their own systems, and I think the use of JEIT will be enriched by reading the companion book and gaining a bit of knowledge of the system, as I strove to do with her MAAT Tarot). One of the defining characteristics of Julie Cuccia-Watts’ tarot work is that is not merely a pretty face, something which is lamentably the case with so many decks published in recent years. With too many decks to count, one is willing to lay bets that the artist sat down with a Rider-Wait- Smith deck and a copy of a “How to Read Tarot”-type book (or, for the slightly more ambitious, The Pictorial Key to the Tarot) and said to himself or herself: “Now, then, how can I illustrate the scene on this card in my own artistic style, and how many of Waite’s/Smith’s symbols can I cull from each scene to get the basic point across with a minimum of esoterica?” Beginning with the Blue Moon and MAAT tarots and continuing into the JIET, this is never the case with Ms. Watts, who is a serious student of astrology and has developed her own complex-yet-graspable systems underlying the structure and characters of her deck. There is intellectual effort behind these great undertakings, and that alone is enough to distingui sh the deck from the majority of contemporary ones. In the case of the JEIT, Ms. Cuccia-Watts has designed a system based both on real sky astrology and the calendar of ancient Egypt. From what I understand, that calendar was an organic part of the fabric of ancient Egyptians’ lives given that it was based on the seasonal rhythms of the Nile river, the basis for Egypt’s entire, multiple-millennia civilization. She has written that the numbered Minors are also based on numerological concepts derived from ancient Egyptian culture and philosophy.